The Butterfly Cottage overlooks a private courtyard with a beautiful mulberry tree in its center, that on a hot summers day provides refreshing cool shade. 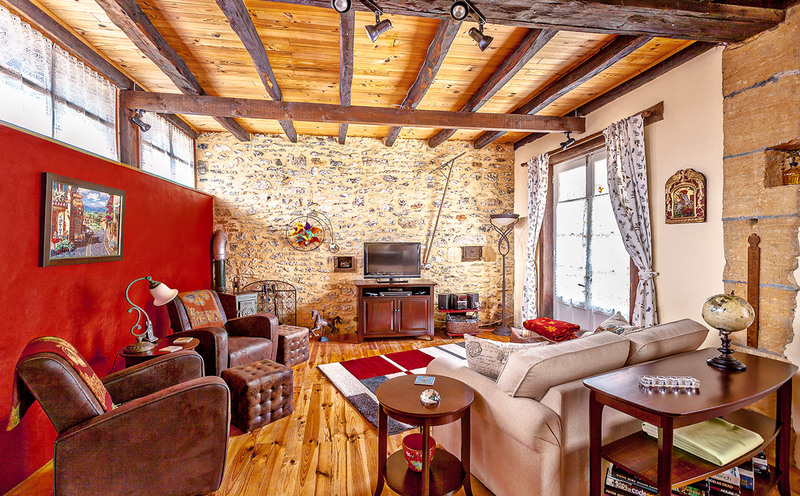 This beautiful charming cottage awaits those who are seeking a holiday filled with comfort, peace and relaxation to re-energize yourself for exploring the beauty of the Dordogne. 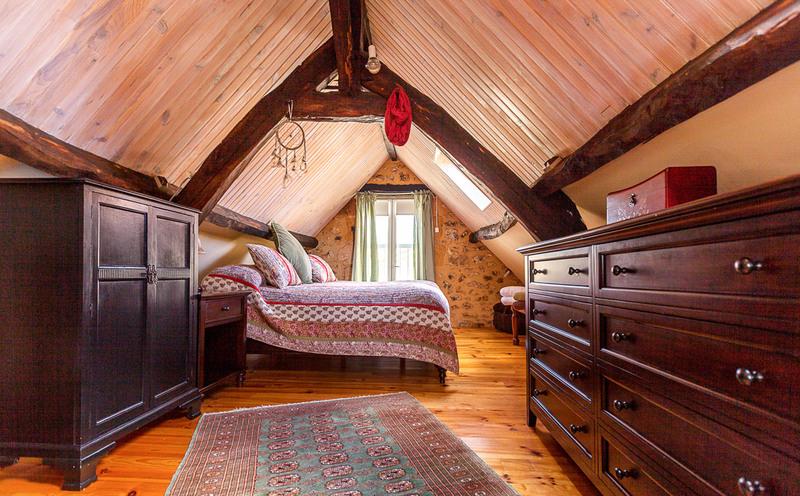 The entire Butterfly Cottage is custom decorated, and is warm and cozy. The living and dining room is one great room, with gorgeous wood floors, a wood burning stove, flat screen TV, DVD player, a CD player with a iPod hook up, and all the modern conveniences of home. 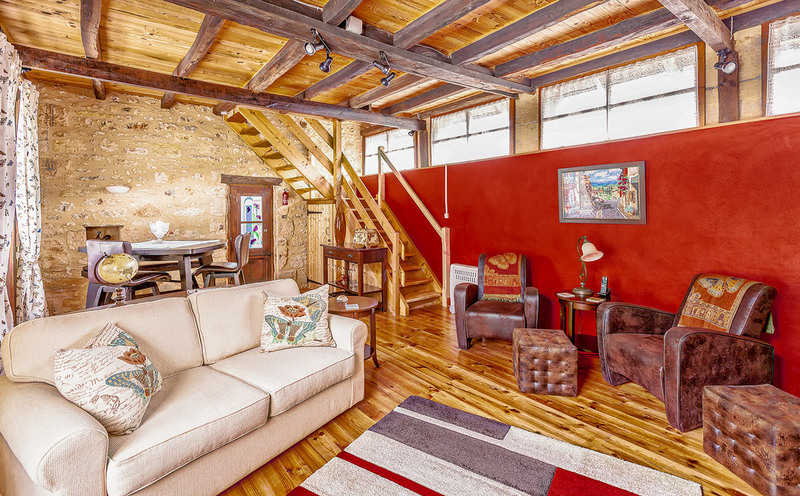 The living room area is decorated with a custom made sleeper sofa, and 2 comfy loungers with foot rests. The dining area has a beautiful mahogany high top table with a seating bench and 2 swivel bar stools. There are lots of windows and french doors throughout the cottage that lets the sunshine in. 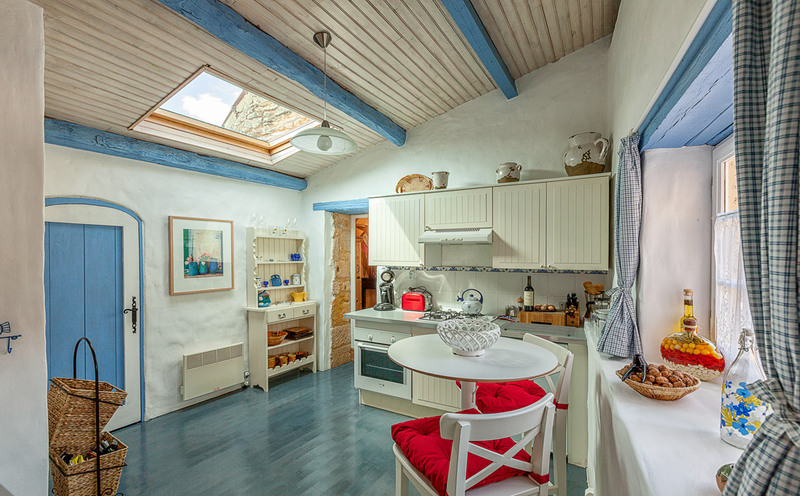 The kitchen has a breakfast table with bar stool chairs, and a wonderful sky light that lets in the fresh air. It is a chefs delight, which is fully equipped with everything needed to enjoy the delicious delights of the Dordogne. Even better, why not let “Chef Dimitri” prepare you a gastronomic delight, to celebrate and highlight your special holiday. The bathroom is down stairs and is fully updated with a new walk-in rain shower. The spacious master bedroom is upstairs with a beautiful wood beam ceiling, wood floors, a mahogany triple dresser, and a beautiful mahogany California King size bed made for a King and Queen!! 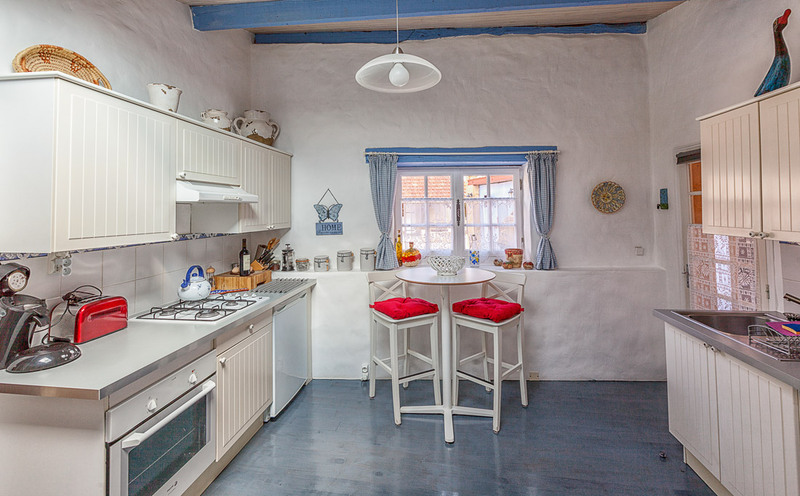 In front of the cottage you will love the beautiful private courtyard with the mulberry tree in its center, which is decorated with gorgeous flowers and bird feeders. In the courtyard you have your own private gas grill, and a comfortable and relaxing wicker patio set, including 2 sunning loungers. 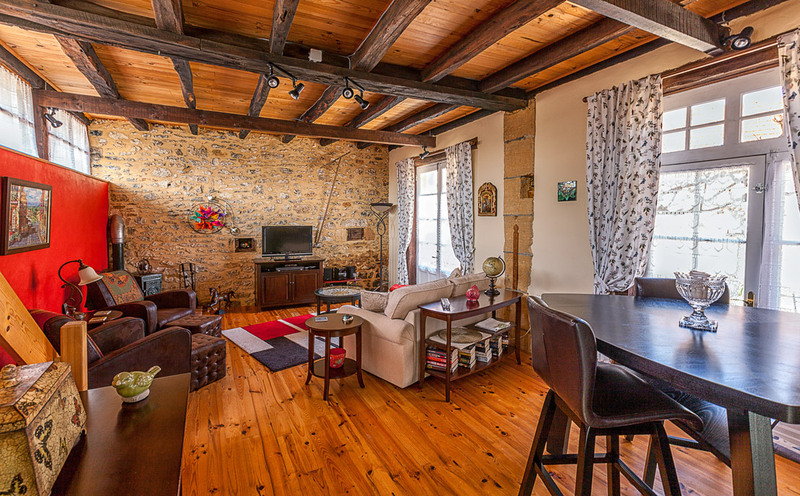 To enjoy those delicious delights and meals of the Dordogne there is a 4 seater dining table and a 2 seater breakfast table, within your private courtyard. You can stay and relax in the beautiful courtyard watching the swallows fly from the barn into the mulberry tree, or go sit in the swing and read a book in the gorgeous garden behind the house, surrounded by mature trees, plants, and beautiful flowers. Go for a swim in the refreshing salt water heated pool or have a romantic evening in the Jacuzzi hot tub, overlooking the lush green pastures of the Dordogne valley. If you are looking for a peaceful, relaxing, and romantic vacation holiday, it is waiting for you here at the beautiful Butterfly Cottage. 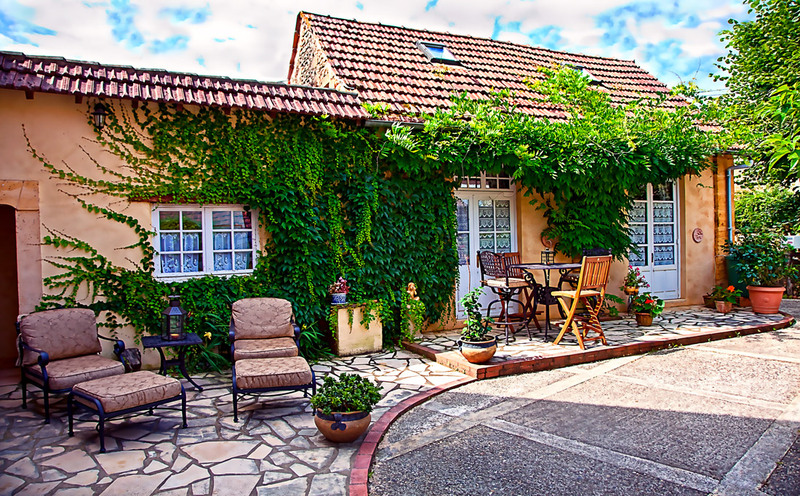 “The Butterfly Cottage hosts, George and Linda, have set a very high bar for the French “gite” experience! “My wife and I have stayed in gites and cottages many times, but both agreed that our stay at Butterfly cottage was the best of all! Perigord is a wonderful place to visit of course, and the cottage was ideally placed to enjoy it without having to drive too far. Linda and George were marvelous hosts, and nothing was too much trouble….when I unpacked my case after the holiday, it was full of Linda’s hand written direction sheets!